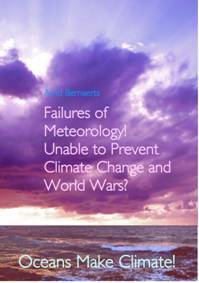 The book: Failures of Meteorology! Unable to Prevent Climate Change and World Wars? Oceans Make Climate! Available from all major book stores and on-line book shop. 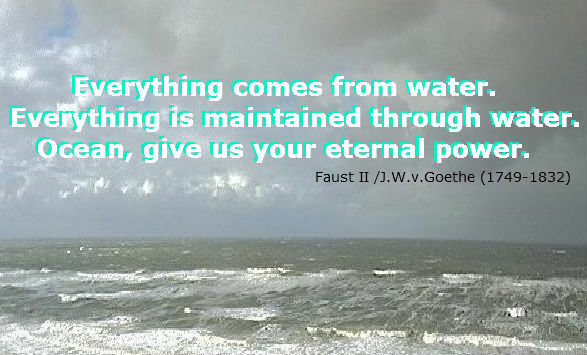 Everything is maintained through water. The decade before WWII had been the warmest in Europe for presumably 500 years. It happened due to a strong warming thrust during the two decades since the end of World War I in November 1918. This very remarkable rise in temperature, which will be discussed in the last chapter of this book (I, p. 189), came to a sudden halt with the beginning of the second major naval warfare in the 20th Century. The trend reversed. For three decades it became colder, marked by three extreme war winters as kick-off. For someone who regards weather and climate as the blue print of the ocean, would have no serious problem to link the sudden turn-around to extreme winter conditions since the last months of 1939 to man�s activities in the marine environment. Seeing this correlation is not well established. This will be discussed below in reference to other aspects and thus the chapter about the first war winter of WWII will be completed. "Anyway, we can conclude that the maximum temperature must be achieved in this decade before a gradual increase in the frequency of severe winters can be expected." However, in his paper on the "big circulation disorder in 1940� published 12 years later, he attributed this �disorder� to sunspot activities without any facts, consideration or explanation (Scherhag, 1951). As he had observed that �the entire polar region was covered by an extremely high air pressure to such an extent in January 1940� (C5, p. 73), one wonders whether he knew that the polar region is sunless during the winter season. What we know for sure is that the immediate years prior to WWI had been some of the warmest, TM1, TM2 (p. 5 & p.15). While the Northern Hemisphere (NH) indicates well above normal conditions, the Southern Hemisphere was close to normal. The two temperature maps TM6 and TM7 (p. 69 & 93) give an overview of the temperature throughout the winter half year 1939/40. The 4th quarter of 1939 deviated significantly from the pervious year, with the exception of November 1939 (TM6). The pounced colder regions over North America and Europe may already indicate that air containing less moisture has started to circle the NH, which has been discussed in section C5. The excerpts for the months Sept/Oct/Nov/Dec 1939 (TM6) reveal that Sept., Oct., and Dec. already indicated for Europe below-average temperatures, while November 1939 appears to be above average, confirmed by national reports in England , Germany and Sweden . For example: In Haparanda-area (north of Stockholm), the surplus amounted to 4�C and even in southern Svealand still 1 to 1.5�C (SMHI, 1939). In contrast, in December 1939 the TM7 indicates an exceptional situation for Europe . How these lower or higher temperatures can in whole or in part can be linked to naval war activities? This requires the processing of available data in a powerful computer center. � the 1934-1939 winters compared to the winters of 1940-1945. __TM3 (Page 25) shows combined temperature conditions for the three war years 1940, 1941 and 1942, per season and in an annual map of averages. � The global warming phase 1881-1939, not showing the special warming phase in the Northern Hemisphere from 1919 to 1939. �The warming phase, which can be assessed as a continuation of the previous phase, but is interrupted by WW2. It seems: The entire Northern Hemisphere is sweating due to excessive warming during the first three war winters (TM2), only Europe is covered by an arctic cold spell, while the USA joins in on the cold briefly only in January 1940 (TM5, p. 59). � The heat reserve available from the moment the air temperatures are so low that the top sea layer can freeze to ice. 3. Two periods during which manmade activities increased for a short period of time by many times, with a high increase of interchange between several sea water layers. The different types influenced the duration of the ice cover during the winter in question, and also the conditions in the next winter. The Baltic may freeze quickly if the air temperatures are low (scenario 1), but that tells nothing about the heat that is still available. As soon as the sea is covered with ice any further heat transfer from the sea water body to the atmosphere decreases to a very small percentage. The heat capacity is still substantial if the temperature is below 5 degrees, which will eventually reduce the icing period, and influence next years sea ice season. 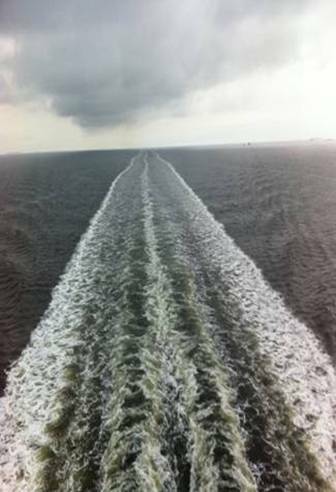 Since propeller driven vessels navigate the sea the natural sea icing process in the Baltic got more and more affected. One needs only to investigate the higher increase of winter air temperatures, and a shortening of the winter season in the region observed during the last century. But to know, to explain, and to observe this is a task of HELCOM, or the numerous scientific institutions mandated and financed to undertake scientific research in the Baltic. As it is difficult to recognize the influence of shipping and other sea uses over a period of 150 years, the two World Wars, which came along very suddenly, fiercely, and pronounced, as reflected by the full sea ice cover in early 1940. It became the prelude of the unprecedented heavy sea ice decade of the 1940s. In a world which had been getting warmer since 1850, not only the sudden severity of sea ice conditions in winter 1939/40, but also the fact that it is presumably the severest sea ice condition within one decade for more than a thousand years (Fig. B-18 & B-19, p. 37f), is by itself a prima facie evidence of naval war as a contributing factor. With WWII in action a strong warming period in the Arctic and Northern Hemisphere came to a sudden end. Actually global warming since the end of the LIA had two phases, namely a general trend, and increased warming since the winter 1918/19, which lasted for two decades until 1940. This warming is discussed in greater detail in Chapter I, together with the part that the First World War from 1914 to 1918 may have played in initiating the most pronounced climatic shift in the arctic during the last 150 years. This trend suddenly died away in close timing with the first war winter in the Second World War. It was a deeply marked shift not only in Europe , but on a global basis it emerged as a steady downward trend for about three decades. The shift already came with the first war winter. In Europe the winter 1939/40 in Europe marks the beginning of a chain of temperature decrease, which continues until the end of global cooling in the mid 1970s. This is confirmed in the TM1 (p.5) concerning the first war winter (D/J/F 1939/40), or with the corresponding months during the three first war winters (1939/40 to 1941/42) in TM2 (p. 15). The study of anthropogenic climate change requires that all elements of this causal chain are examined for their relevance, either to confirm the participation of individual elements, or to prove that they have not contributed. This includes the naval warfare in the North Atlantic and Pacific, this investigation is taken care of in Chapter G and Chapter H.
One winter can make a big difference in climate research. The winter 1939/40 gives proof of it. Four months at war, and as the parties involved in the war have demonstrated that man is able to change weather. As soon as the belligerent and neutral powers had sent their entire naval forces on missions in European and Atlantic waters, Europe returned back to a Little Ice Age conditions almost immediately. It was like a large scale experiment about the question, on how much alteration in the marine environment is necessary to have a significant and observable impact on weather. The result was impressive. The weather showed up with deviation and many changes. In Central Europe it was the coldest winter since about 1820, a time still ruled by the LIA. The weather experts did not recognise anything about the anthropogenic relevance. Numerous alterations of weather conditions during the first six months of the Second World War came unexpectedly. The meteorological services failed thoroughly. Completely unaware of the fact that weather operates on the prevailing conditions of the ocean and seas, they did not foresee the inevitable danger of anthropogenic weather modification by naval war activities. They did not imagine that large scale fighting at sea by huge naval armadas during an autumn season in sensible sea areas with instable conditions is a perfect experimental tool. Numerous examples could be presented and discussed, in order to prove these facts. It starts with the suddenness, unexpectedness and the severity of the winter 1939/40, about which the two expert contemporary witnesses, Drummond and Rodewald, made some comments. Their personal impressions are confirmed by many astonishing facts. There was the heavy rain between Basel and London , which partly marked the frontline with about two million soldiers on either side ready for battle. The wind shifted from commonly prevailing south-westerly to north-easterly directions. The move of cyclones and humid air from the Atlantic eastwards via Western Europe was blocked. Instead in early December 1939 cold air arrived from the East with continental high air pressure systems not to loosen their grip before March 1940. General Frost�s reign dragged Central Europe into the coldest winter for more than 100 years. A number of cold records happened. The sea ice cover and intensity in the Baltic was the highest possible and the first again after a pause of six decades. There are stunning surprises for a number of issues. But nothing is on record about what science has to say about all of this. Most of the observed deviations could have been predicted if the weather experts at that time had regarded that weather is an appendix of the ocean, or at least have analysed the impact of naval war during WWI on the war weather pattern in depth (Chapter I). With such knowledge they could and should have warned the world leaders before WWII was to start that a war would indefinitely include a serious interference and experiment with climate. They did not. The weather experts were neither aware of anything regarding this aspect, nor did they at least wake up when a lot of meteorological events happened within a short period of time into the war. But what do we see now, 70 years later. Climatology calls the world at doom due to the threat of anthropogenic global warming (AGW) over the last two decades. At least 5�Celsius temperature, and several meters sea level rise, caused by the industrial release of carbon dioxide gases, is inevitable, so they warn the governments and the general public. For certain, if such a scenario of threat and doom had existed before the Second World War started, the world in 1939 would have listened, and undertaken all possible measures to prevent Adolf Hitler and the Third Reich from using the sea for naval warfare. Furthermore, a discussion about the �greenhouse effect� since the �global cooling� ended in the early 1980s, would never have taken place. But unfortunately the weather experts understood too little of what it was all about. They were not even keen enough to analyze and learn from what they saw with their own eyes. On the meteorological front two further extreme winters followed. Thus they failed to do better during the following five years the world was at war. However a global cooling continued toward cold conditions for another three decades.